I HAVE to deal, under strict limitations of space, with a long life, almost the whole of its adult period passed in the exercise of sovereignty–a life which is in effect the history of England during forty-five years, abounding at the same time in personal interest, and the subject, both in its public and private aspects, of fierce and probably interminable controversies. Evidently a bird’s-eye view is all that can be attempted; and the most important episodes alone can be selected for consideration. The daughter of Henry VIII and Anne Boleyn was born on 6 September 1533. Anne was niece of Thomas, third Duke of Norfolk, and all the great Howard kinsmen attended at the baptism four days afterwards. Elizabeth was two years and eight months old when her mother was beheaded, and she herself was declared illegitimate by Act of Parliament. It is not recorded that in after years she expressed any opinion about her mother or ever mentioned her name. She never took any steps to get the Act of Attainder repealed; but perhaps she indirectly showed her belief in Anne’s innocence by raising the son of Norris, her alleged paramour, to the peerage, and by the great favour she always showed to his family. During her father’s life Elizabeth lived chiefly at Hatfield with her brother Edward, under a governess. Henry had been empowered by Parliament in 1536 to settle the succession by his will. In 1544 he caused an Act to be passed placing Mary and Elizabeth next in order of succession after Edward. By his will, made a few days before his death, he repeated the provisions of the Act of 1544, and placed next to Elizabeth the daughters of his younger sister, the Duchess of Suffolk, tacitly passing over his elder sister, the Queen of Scotland. 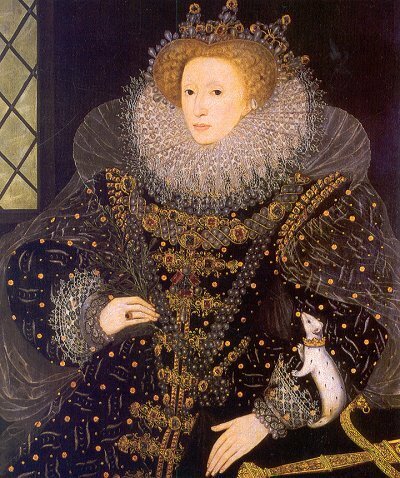 After her father’s death (January 1547) Elizabeth, then a girl of thirteen, went to reside with the Queen Dowager Catherine, who had not been many weeks a widow before she married her old lover Thomas Seymour, the Lord Admiral, brother of the Protector Somerset, described as “fierce in courage, courtly in fashion, in personage stately, in voice magnificent, but somewhat empty of matter.” The romping that soon began to go on between this dangerous man and Elizabeth was of such a nature that early in the next year Catherine found it necessary to send her away somewhat abruptly. From that time she resided chiefly at Hatfield. In August 1548 Catherine died, and the Admiral at once formed the project of marrying Elizabeth. This and other ambitious designs brought him to the scaffold (March 1549). It does not appear that Elizabeth saw or directly corresponded with him after he was a widower. But she listened to his messages, and dropped remarks of an encouraging kind which she meant to be repeated to him. She knew perfectly well that the marriage would not be permitted. She was only flirting with a man old enough to be her father just as she afterwards flirted with men young enough to be her sons. We already get a glimpse of the utter absence both of delicacy and depth of feeling which characterised her through life. When she heard of the Admiral’s execution she simply remarked, “This day died a man with much wit and very little judgment.” With Elizabeth the heart never really spoke, and if the senses did, she had them under perfect control. And this was why she never loved or was loved, and never has been or will be regarded with enthusiasm by either man or woman. For some time after this scandal she was evidently somewhat under a cloud. She lived at her manor-houses of Ashridge, Enfield, and Hatfield, diligently pursuing her studies under the celebrated scholar Ascham. When Edward died (6 July 1553) Elizabeth was nearly twenty. Although Mary’s cause was her own, she remained carefully neutral during the short queen-ship of Jane. On its collapse she hastened to congratulate her sister, and rode by her side when she made her entry into London. During the early part of Mary’s reign her life hung by a thread. The slightest indiscretion would have been fatal to her. Wyatt’s insurrection was made avowedly in her favour. But neither to that nor any other conspiracy did she extend the smallest encouragement. Her prudent and blameless conduct gave her the more right in after years to deal severely with Mary Stuart, whose behaviour under precisely similar circumstances was so very different. Renard, the Spanish ambassador, demanded her execution as the condition of the Spanish match, and Mary assured him that she would do her best to satisfy him. In the time of Henry VIII. such an intention on the part of the sovereign would have been equivalent to a sentence of death. But Mary was far from being as powerful as her father. The Council had to be reckoned with, and in the Council independent and even peremptory language was now to be heard. It was not without strong protests on the part of some of the Lords that Elizabeth was sent to the Tower, Sussex, a noble of the old blood, who was charged to conduct her there, took upon him to delay her departure, that she might appeal to the Queen for an interview. Mary was furious: “For their lives,” she said, “they durst not have acted so in her father’s time; she wished he was alive and among them for a single month.” But it was usless to storm. The absolute monarchy had seen its best days. Sussex, fearing foul play, warned the Lieutenant of the Tower to keep within his written instructions. Howard of Effingham, the Lord Admiral, had done more than any one else to place Mary on the throne. But he was Elizabeth’s great-uncle, and he angrily insisted that her food in the Tower should be prepared by her own servants. A proposal in Parliament to give the Queen the power to nominate a successor was received with such disfavour that it had to be withdrawn. Finally the judges declared that there was no evidence to convict Elizabeth. Sullenly therefore the Queen had to give way. Elizabeth was sent to Woodstock, where she resided for about a year under guard. This was only reasonable. An heir to the throne, in whose favour there had been plots, could not expect complete freedom. In October 1555 she was allowed to go to Hatfield under the surveillance of Sir Thomas Pope. During the rest of the reign she escaped molestation by outward conformity to the Catholic religion, and by taking no part whatever in politics. But as it became clear that her accession was at hand there can be no doubt that she was engaged in studying the problems with which she would have to deal. She was already in close intimacy with Cecil, and it is evident that she mounted the throne with a policy carefully thought out in its main lines. When Mary was known to be dying, the Spanish ambassador, Feria, called on Elizabeth, and told her that his master had exerted his influence with the Queen and Council on her behalf, and had secured her succession. But she declined to be patronised, and told him that the people and nobility were on her side. From Queen Elizabeth by Edward Spencer Beesly. Published in London by Macmillan and Co., 1892.